Hong Kong is part of China but with a different character and vibe. When talking about Hong Kong … I’m biased! How can you describe it? Shabby chic? Very clean and very grubby? Overcrowded and busy? Cosmopolitan and dynamic? Asian and Western? For Hong Kong all fit in some way. We travelled from Beijing down through China ending up in Hong Kong. Glad that we did it that way as the China experience got better and better. I’ve written in detail about the trip and my views on China here. Hong Kong is different. You can feel it once you cross the border at Shenzhen. There is still the police and security present everywhere but the edginess is taken off. Hong Kongers are less loud, less abrasive, more considerate and more friendly. The feeling that you ae a rip off “target” is gone. There is more personal freedom – Facebook, Twitter and Google aren’t banned. Social media groups aren’t targeted. VPN’s are not a target for shutting down. The trip from Shenzhen to Hong Kong Island was one of walking and walking and jumping on and jumping off different train lines. A journey in often crowded trains of about an hour and a half on a hot humid day with lots of luggage . There were no “good” elements in that experience. It's good to hear that this transition is being improved. We stayed in an AirBnB close to the Sheung Wan MTR station. A fantastic location … but not the greatest accommodation. One accepts that in Hong Kong places are small but after the walk from the station, schlepping heavy cases up 3 flights of narrow, steep steps in a grubby building (the weather still hot and very humid) was not a great end to the metro safari!! The apartment did have 2 bedrooms as advertised but as there was no space for luggage it had to be stored in the living room. The bathroom was a wet space and quite a novel experience. The shower was good and the air-conditioning kept the living space acceptably cool ... in one room through a hole cut in the curtain. When selecting an AirBnB read the comments carefully … and then read between the lines. For example, my final comments about the apartment mentioned the good responsiveness of the host and the excellent location. In the other comments there were references to the “wet bathroom” and the “flights of stairs” and the “space” but these criticisms are often hidden behind the positive remarks. This accommodation hitch didn’t detract in any way from our visit. We took advantage of all the positive factors like the location and proximity to restaurants to have a most enjoyable few days. We took the ferry to Macao for another hot, humid sightseeing day. Not a good choice. Macao retains remnants of its Portuguese heritage but is now engulfed by opulent, showy gambling joints. Over the last few years gambling in Macao has taken quite a financial blow as the Chinese authorities have taken a strong stance against corruption and money laundering. There were some interesting sites - Macao Museum (well laid out with some engaging exhibits), the ruins of St Pauls and the Portuguese styled architecture. The town was being decorated in preparation for the Chinese National Holiday week with an abundance of bright yellow and red decorations. This is a great way to get an overview of Hong Kong. With 3 different routes, the traffic and distances to travel it is impossible to do this justice in one day. Ideally take the 48 hour pass with some added attractions and over 2 days you’ll have covered a lot of Hong Kong. The tram ride to the Peak is fun and you get a panoramic view of the city below. For the more energetic it is also possible to hike up the mountain. There are also a number of excellent tours we did the one day tour to Lantau island with visits to a local village, the Big Buddha, lunch at the monastery and a cable car ride. It was a great day. The gardens are peaceful refuge in the concrete jungle. With orchids, aviaries and a number of different apes there is something for all ages. 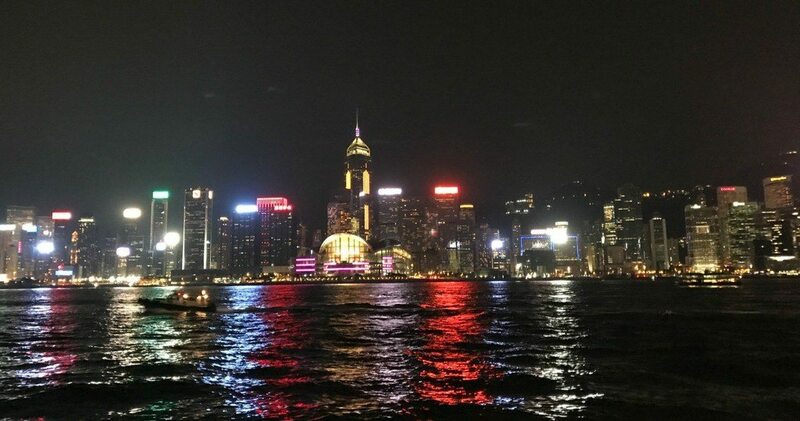 It is best to watch the nightly at 8 PM light and laser show from Tsim Sha Tsui. The buildings are lit up and the laser show is set to music. Day after day, year after year crowds turn up every day to enjoy this 15-minute show. The Star Ferry trip back from Tsim Sha Tsui to Hong Kong island also provides stunning views of the night time skyline. Selecting an AirBnB is like buying a house from an advert. Read the comments carefully, wherever possible reading between the lines. Put more emphasis on what’s not being said than the actual comment. Do not travel to China or any of the SE Asia countries with large Chinese populations during the Chinese National Holiday week or during the Chinese New Year. Even out of these periods sightseeing attractions and weekends are crowded and bustling. These weeks become a nightmare for travelling and accommodation with premium pricing in full force.